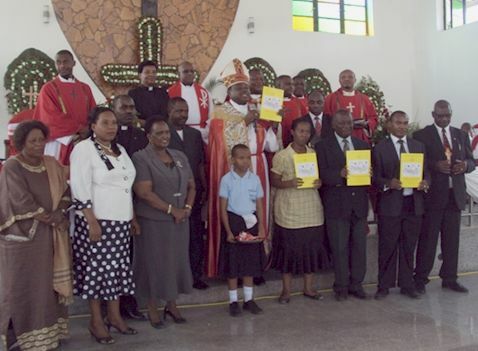 On June 10 this year the Evangelical Lutheran Church in Tanzania (ELCT) launched a training manual on how to do away with violence in the society. The ceremony officiated by the ELCT Presiding Bishop, Dr. Alex Gehaz Malasusa was held during a church service at Kinyerezi Lutheran Parish in Dar es Salaam, in the ELCT Eastern and Coastal Diocese who said "every body including church leaders and government leaders are required to do justice on all occasions." On the "Eradication of violence in the society". © 2012 ELCT /PHOTO BY ANICET MAGANYA. At least 700 people including officials from government, Non governmental officials and civil rights activists attended the service that was used to inaugurate Kinyerezi Lutheran Parish. And when the Presiding bishop asked if they supported the idea of the manual, all those in attendance raised the voice saying "Yes". He said the church will speak out against injustice acts against individuals or a group of people. He said the leadership of the Church was aware that majority of the people were ignorant of the basic laws of the land prompting the church to take action in that direction by launching a training manual. Earlier on Mr. Brighton Killewa the Secretary General of ELCT emphasized the importance of ensuring justice in the society. He said the most affected and marginalised groups in the society are women, the disabled and children who are denied justice as they are ignorant of their legal rights. The Coordinator of the ELCT Advocacy Desk Pastor Anicet Maganya urged other people of good faith to join in the campaign to ensure people are made aware of the basic laws of the land to eradicate violence and avoid humiliation as a result of ignorance of the law. The guideline was produced by the ELCT in collaboration with the Danmission in Denmark.